If Tyson is speaking the parroted sound bite based language of East and Central Africa’s conflicts, then who addresses relevant political tensions in meaningful ways? In her overtly political exhibition ‘Until Lions Write Their Own History…’ textile artist Deanna Tyson evokes familiar images of familiar conflicts in a mixed media attempt to ‘talk politics’. 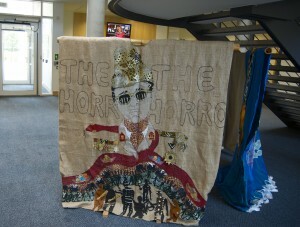 She has situated her pieces across three floors of the Alison Richard Building at the University of Cambridge. This space is home to three area studies programmes, as well as centres for both Governance and Human Rights and Arts Social Sciences and Humanities (CRASSH). It hosts conferences that welcome visitors from a variety of multinational organisations, including UN Special Rappoteurs. Not surprisingly, this somewhat schizophrenic exhibition seems to be designed to fit-in with the complex threads of the academic setting. Unfortunately ,when it comes to East and Central African imagery, she fails to capture the intricacies of conflict that entangle the region. The title is a permutation of a proverb that was popularised by the late author Chinua Achebe. In Achebe’s version he notes: “There is that great proverb—that until the lions have their own historians, the history of the hunt will always glorify the hunter[…]Once I realised that, I had to be a writer. I had to be that historian.” (1994, Paris Review) So it seems that Tyson assumes her position as an artist to transfer into being a historian. This is a fair position to take, indeed many artists have transformed historical narratives. The problem is, Tyson’s work glorifies the hunter by replicating his iconic image. Her consumption of histories appears to be tainted by Western media icons, and reproduced much the same. 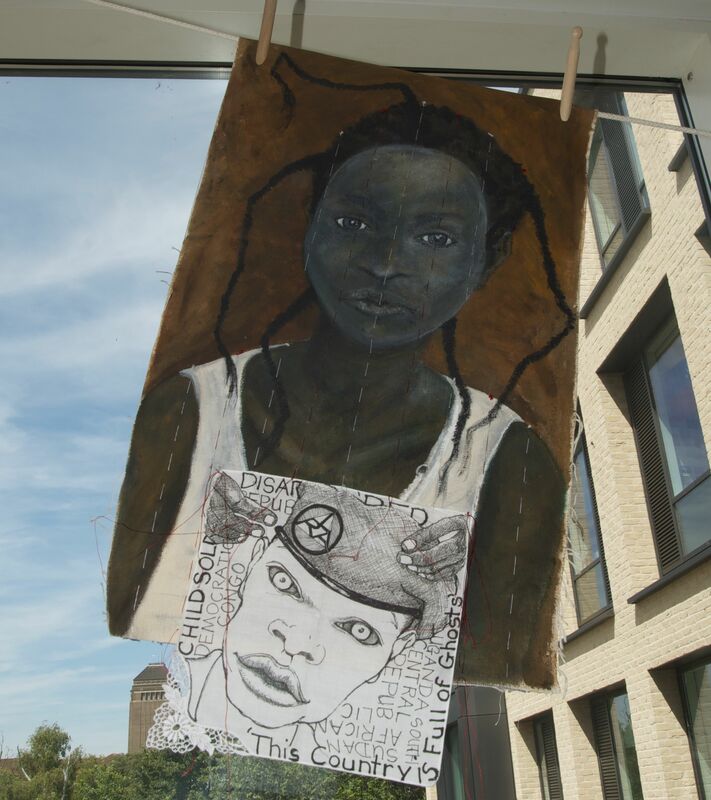 Enshrined in her pieces are tired portraits of dictators, AK47 wielding rebels and child soldiers. 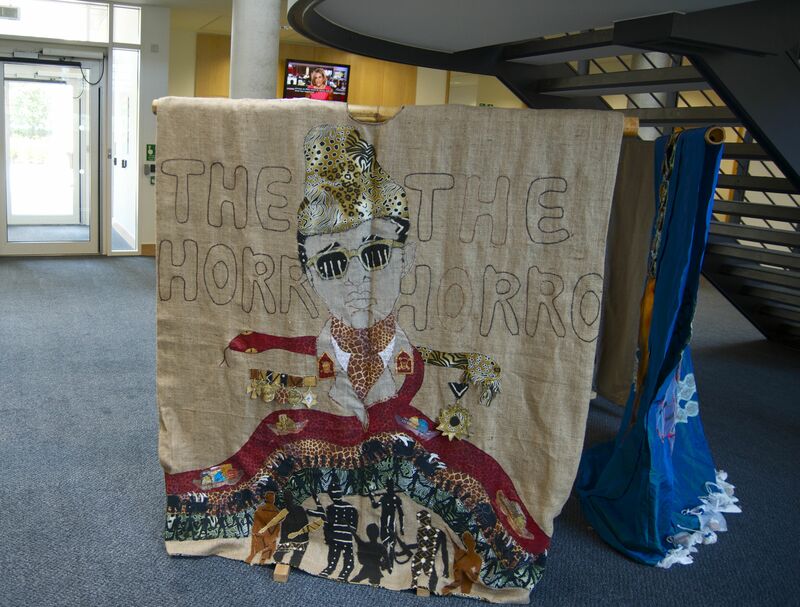 And, the rumours that lurked in the hallway when I was touring, spoke of a Robert Mugabe floor mat that had been placed outside the Centre for African Studies. Apparently the Centre asked to have it removed. One might infer that they would have felt that this artistic attempt oversimplified the experiences of those under Mugabe’s reign— perhaps even experiencing discomfort when stepping on a ‘revolutionary hero’s’ face. “I regard my works as three dimensional political cartoons.” says Tyson. When it comes to one of her transcontinental subjects in the collection, the war in the Democratic Republic of the Congo, cartoons replicas of Western media reproductions are merely inadequate. Evoking the image of Mobutu Sese Seko, coupled with the words “The Horror, The Horror”, Tyson encases the DRC in a shell of histories; guarded by the hunter wearing his prey: Mobutu’s famous leopard printed hat. 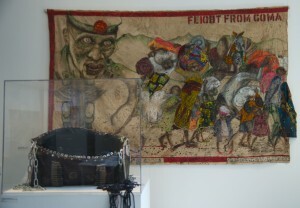 One piece called Flight From Goma portrays refugees on the move from a tyrannical army commander. The key failure here is that the main character of the piece is indeed the hunter, even possibly the recently captured Boscoe Ntanganda. The image of the refugees depersonalises the interpersonal experiences that need to be represented. As one moves around the space, you will surely happen upon the Child Soldier piece. 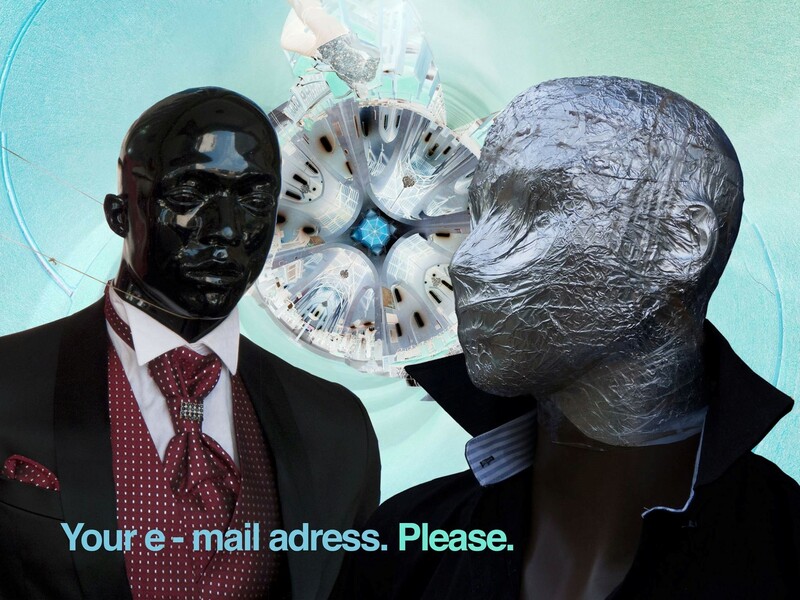 Amalgamated into this image are stereotyped repetitions of guilty countries, the spiritual realm, and the ‘disappeared’. This piece does not glorify (verb: describe or represent as admirable) the hunted, rather it shows the resident audience of academics what they already know. Furthermore it is both paired with and parroted through the mass media, including the CNN streaming behind Mobutu himself. Who Speaks the New Language? If Tyson is speaking the parroted sound bite based language of East and Central Africa’s conflicts then who addresses relevant political tensions in meaningful ways? Remaining in the media of textiles, it would be easy to look at the work of Yinka Shonibare. Shonibare is most famous for his kitenge dressed, headless sculptures that seek to remove the gaze towards embodying stronger issues of greed and politics. Spoken in the collage-style chrome ink prints of Kudzani Chiurai is a challenge the ‘coolness’ of wielding an AK or being a gangster. What is most curious about this exhibition is that all the pieces are for sale. In essence Tyson allows, for £450 to own Child Soldier or for £7,000 to purchase ZCZC A History of Congo. Surely, a UN Flight From Goma would be less than Tyson’s £2,500 asking price. In line with Adagba and Achebe, it seems that to meaningfully explore politics in such a complex region, the artist must abandon the sentiments that encase the Western gaze into Africa’s conflicts. Kara Blackmore is an anthropologist, museum curator and Senior Editor for Startjournal.org.